The California High-Speed Rail Authority promises to “achieve net zero greenhouse gas (GHG) emissions in construction” and is committed to operate the system on “100% renewable energy” by contracting for “400 to 600 megawatts of renewable power”. These promises may please environmentalists, but they cannot be kept. The Authority has provided only limited information regarding GHG construction emissions. Its 2013 Emissions Report estimated 30,107 metric tons in GHG “direct emissions” for the first 29 miles of construction. “Indirect emissions” associated with the manufacture and transport of materials, primarily concrete, steel, and ballast were not reported because, according to the Authority, precise quantities, sources, and suppliers were not known. A more plausible reason is the their desire to hide from the public more than 90% of GHG emissions associated with their project. Regardless, recent testimony by the Authority’s CEO clearly indicates that indirect emissions can now be tallied. Speaking before the Assembly High-Speed Rail Oversight Committee on January 27, 2016, CEO Jeff Morales, spoke at length on how costs were estimated. He described the assemblage of 200,000 individual line items including concrete, steel, dirt, electrical, etc. and said each includes a unit cost which is multiplied by the units required to build the system. Total GHG construction emissions would still be unknown today were it not for the work of professors Mikhail V. Chester and Arpad Horvath working in UC Berkeley’s Department of Civil and Environmental Engineering. They studied this issue, published their findings in 2010, and estimated that 9.7 million metric tons of GHG would be emitted during the construction of the statewide system; primarily because of the production of massive amounts of concrete and steel. Using mid-level occupancy for the three competing modes of travel (high-speed train, auto, and airplane) the authors estimated it would take 71 years of train operation to mitigate the project’s construction emissions. 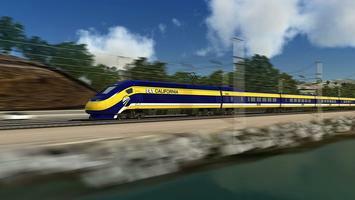 California’s Legislative Analyst Office came to a similar conclusion in a 2012 report critical of using GHG reduction funds to pay for Phase 1 (Los Angeles to San Francisco) of the statewide system because “if the high-speed rail system met its ridership targets and renewable electricity commitments, construction and operation of the system would emit more GHG emissions than it would reduce for approximately the first 30 years”. Here, the LAO appears to be citing an updated Chester and Horvath study, published in July 2012, which focused on only Phase 1 of the high-speed rail project, as outlined in the Authority’s Revised 2012 Business Plan. They took into account additional highway infrastructure that could be avoided as well as claims that “a future CAHSR system will likely see improved train performance and an opportunity for increased renewable electricity usage". However, the Authority promised “zero net greenhouse gas emissions in construction”. A reduction in California’s GHG emissions due to the trains’ operations was to help reduce the state’s future GHG emissions, not merely mitigate construction releases. The Authority’s zero construction emissions promise relies heavily on a tree planting program. More than 5 million trees, each more than 50 feet tall, would need to be grown and perpetually maintained to recapture the 9.7 million tons of GHG construction emission. However, one year into construction, the Authority’s CEO admitted that not a single tree had been planted. Worse, as part of their project, the Authority plans to cut down thousands of trees south of San Francisco to electrify Caltrain trackage. Chester and Horvath generously assumed the trains would run on a power mix relatively high in renewable sources. However, high-speed electric trains would replace fossil fueled propelled automobiles and airplanes. When Phase 1 is completed, the trains will place a new demand on the electric grid that must be met immediately by starting up an idle generator capacity. It may be a peaking unit in California powered by natural gas or a coal burning plant in Utah. The exact source is unknowable, but it will not be a wind or solar powered electric plant. These sources will already be generating all the power they can produce when the first trains require additional power. The Authority’s business plans are constantly changing as are their assumptions on energy consumption and energy cost. The 2012 Business Plan is cited, a plan that referred to paying 15.2 cents/kWh for electrical energy, inclusive of a 3 cent premium for renewable energy. Energy consumption was established at 63 kWh/mile. Train miles traveled between 2022 and 2030 was projected to be 99 million, resulting in an energy use of 6,300 million kWh. In order to make good on their claim that they will power the trains with 100% renewable energy the Authority needs to fund the construction of the necessary renewable power plants. California Valley Solar Ranch, a 250MW facility producing 650 million kWh/year recently built at a cost of a $1.6 billion ($1.2 billion financed at a 3.5% interest rate using a federal loan guarantee coupled with a check from the U.S. Treasury for $430 million), serves as a proxy for the needed capital. The Authority’s trains would consume 1,200 million kWh in 2030 and need the output of 1.85 Solar Ranches; 460MW of capacity costing $3.0 billion. A premium of 42 cent/kWh, fourteen times the Authority’s offer, would be needed to raise the necessary capital by 2030. More than 20% of this capacity, costing half a billion dollars, must be constructed before the first trains run. Otherwise, those trains will be totally powered by fossil fuels, meaning the GHG emissions per passenger mile will be no better than for two passengers traveling in an automobile which meets the federal fuel efficiency standards scheduled to be in place in 2022. The issue of global warming needs to be addressed. However, the planting of millions of trees and the spending of billions of dollars on a fossil fuel propelled train is not a practical or cost effective way to address the problem. From the climate point of view, the Authority’s project is detrimental because of its massive construction GHG emissions and because it diverts funds from other actions, such as providing financial incentives for ride-sharing and for the purchase of zero emission or low emission vehicles that could really help address the serious problem of global warming. Michael J. Brady has been a litigator and appellate lawyer for 50 years; he has worked on opposing California’s high speed rail for 10 years. Mark Powell has been assisting Mike Brady for seven years; he is a retired chemist for Union Oil Co.